Another interesting project has popped into my inbox. EASE History is a resource being developed at Michigan State University by doctoral student Brian Collins and a band of others. It's based on Rand Spiro's Cognitive Flexibility Theory, work that deserves to be more widely known by teachers than it is. 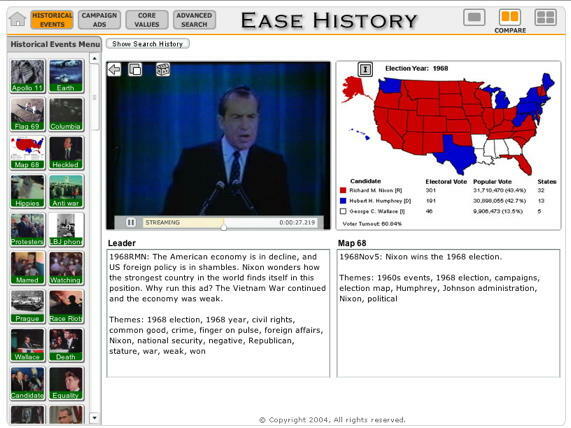 EASE History provides an interface to scores of short video clips and other resources covering the 20th Century. It's designed for inquiry, engaging curiosity, compare and contrast... all the usual Good Things To Do With Your Head. Though Cognitive Flexibility Theory tilts towards more open-ended inquiry, there's no reason that EASE History couldn't be the core resource for a more structured WebQuest. The Concept Clarification design patterns could be used to explore abstractions like stability and diversity. The Analyzing Bias pattern is tailor made for analyzing the campaign ads on the site. Other patterns, too. I spent a half hour reminiscing about the 60s while exploring EASE History, wondering why today's antiwar protests are so tepid compared to the ones I participated in. 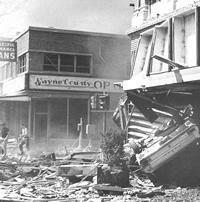 Maybe we're still at about 1965 and just starting to wake up. A few months ago I blogged about Stewart Brand's Environmental Heresies, an article in Technology Review that recommended that environmentalists take a fresh look at nuclear power as a part of the way out of the mess we're in. I'm becoming sympathetic toward that view, as fusion power, zero-point energy, and unlimited ergs from Aladdin's lamp are nowhere near coming to fruition. Living in a coastal city, I find it easy to picture what a rise of a few feet in sea level is going to do to us. Something different has to happen, and soon. According to its author, Steward Brand has endorsed Rad Decision, a techno-thriller about a nuclear power plant disaster. I've started to read it, and so far it's kept my interest like any good airport book. The author is an engineer at a nuclear power plant and he's intending it to be an entertaining way to learn more about the topic. What's interesting to me beyond the topic, though, is the use of a blog as the means of pubishing the book. It's divided up into 37 episodes, each intended to be read in about 15 minutes. A new episode is posted three times a week and right now he's up to number 28. Use reverse chronological order or not? Engage readers with comments on each posting or attach a forum to the whole b log? Give the readers a vote on where the story goes next? Bring in guest bloggers to add commentary as the story unfolds? Link to educational resources as they become relevant? Include suggested activities for classroom use? The author has ended up on the simpler side of each question, but others who follow will take this idea in different directions. It's interesting to watch a new format like this emerge. This must be what is was like when movies first appeared. Or opera. My optometrist has a nifty new instrument in the examination room that lets her gaze deeply into my retina looking for signs of trouble. Normally, that requires dilating the eyes so that I spend the rest of the day looking like a crackhead, and ten minutes of her wearing a miner's cap and directing my eyes through all four compass points. Instead, her able (and cheaper) assistant sits me down in front of what looks like a portable peep show and flashes me eight times in light that is exactly the same shade of green used by the Martian weapons in the 1953 version of War of the Worlds. Much more pleasant, and then the good doctor gets to tour me around my retina pointing out the scenic attractions as she goes. So it's quicker, educational, and on request they'll send you the pictures. 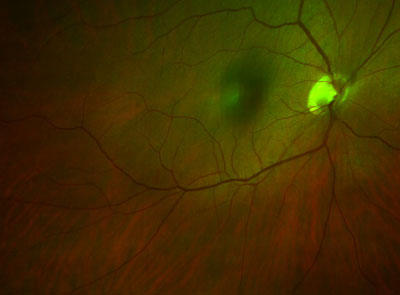 What you see above is my right eye. 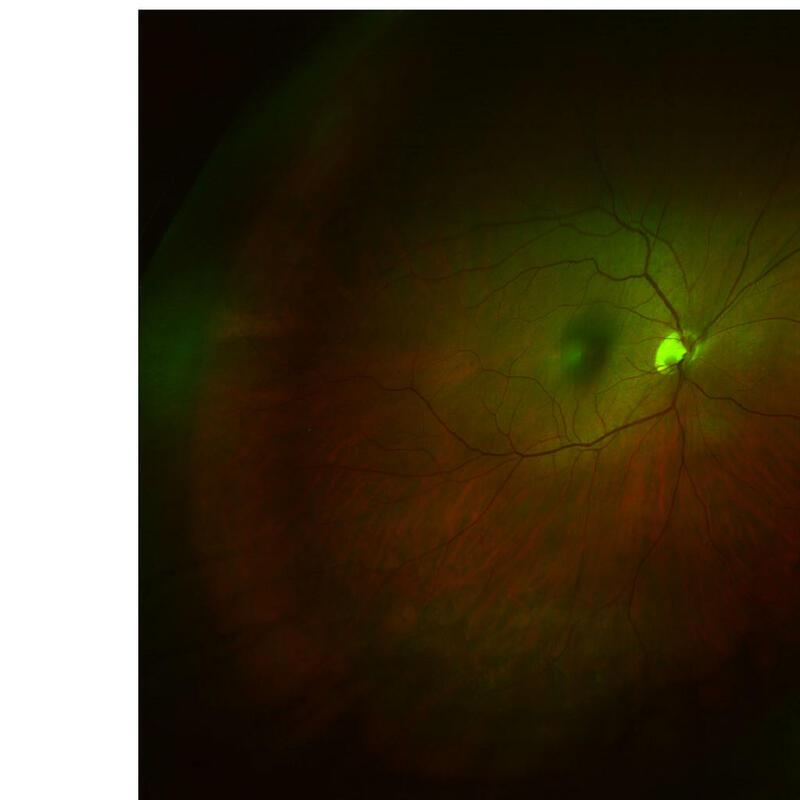 The shiny psrt is where the optical nerve hooks in, and the out of focus thing just to the left of that is a floater cruising its way through my vitreous humor, one of the least funny parts of my body. Very cool, isn't it? Now don't ever say I haven't shared my innermost secrets here. This is fantastic! 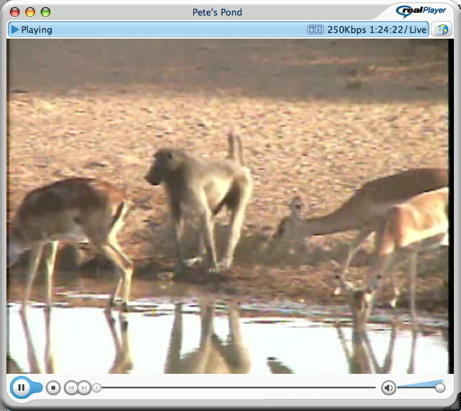 National Geographic has put up WildCam Africa, a live look at a pond in Botswana. The quality of the video and sound is unbloodybelievable. I'm listening to bird calls that take me back to my years in Sierra Leone. In the last hour that I've been tuned in, I've seen ostriches, an elephant, a monkey, deer-like things with horns, cattle-like things, all taking a turn at drinking from the pond. This would be a tremendous resource for anyone teaching about animals. Right now, late evening on the US West Coast is around dawn in Botswana and the place is hopping. During US school hours, an infrared camera is used to see the action at night. Do not miss this!